WE'VE ALL DONE IT: we meet someone new, and we immediately ask, “What do you do?” In return we expect a job title—teacher, accountant, salesperson. In today’s social shorthand, job = vocation = identity. But on the eve of the Reformation, the idea of vocation had a far different significance. At the time that the young Martin Luther entered the Augustinian monastery at Erfurt in Germany in 1505, the idea of a specific calling or vocation was largely restricted to religious and churchly endeavors: monks, nuns, priests, bishops. Other jobs were just that—jobs. Later Protestant reformers (in the Reformation’s “magisterial” or “mainline” strain found in the Lutheran and Reformed traditions) took this basic perspective—vocation is relevant to all Christians—and made it the foundation of a whole new “take” on doing one’s job. But magisterial Reformers made it clear that even though all jobs were important, a hierarchy of callings according to worldly standards still remained: different orderings of authority and responsibilities throughout the different parts of society. Kings are not peasants, and magistrates are not plumbers. In this they differed from more “radical” reformers (Anabaptists and their kin) who usually rejected worldly notions of hierarchy or rank, drawing a sharp line between the church and the world and emphasizing unity, charity, and equality among God’s people. Genevan reformer John Calvin (1509–1564) emphasized the universality of Christ’s lordship and the corresponding mandate for all believers to act as responsible stewards in God’s world. While today we connect Calvin’s belief in Christ’s lordship with his teaching that God sovereignly predestined our salvation, his arguments also had implications for the job market. The transplanted Frenchman and lawyer-turned-pastor agreed with Luther: God calls all believers, regardless of whether they are clergy or laypeople, to follow him in their vocations. But as he tried to reform Geneva, Calvin strongly resisted more “radical” efforts that might subvert social order and peace. And he quite comfortably distinguished between different offices and responsibilities within the church: minister, elder, deacon, and doctor (or “teacher”). Calvin thus wrote in his Institutes, “Each individual has his own kind of living assigned to him by the Lord as a sort of sentry post so that he may not heedlessly wander about throughout life.” Distinctions between callings have to do with considerations of worldly authority and responsibility, but are not an indication of more or less worth in God’s sight. For Calvin, as for Luther, the justification of all believers by grace through faith undercut any basis for arrogance. Whether given little authority or much, everyone is accountable to God, and greater authority results in greater accountability (Luke 12:48). Calvin’s friend and contemporary Martin Bucer (1491–1551) articulated, defended, and promoted this perspective on vocation. Bucer, a Dominican monk turned Protestant pastor, spent most of his life in Strausbourg until conflict drove him into England in exile in 1549. There he constantly complained about the food and the endless cold—at one point asking his wife to send him a stove. While he was trying to warm up, he served as Regius Professor of Divinity at Cambridge. For Bucer the Christian’s calling meant a responsibility under God, directed toward promoting the good of others. Christians must figure out for themselves how to best express Christ’s love for their neighbors amid a variety of competing responsibilities, differing depending on social station. By those standards he judged that “the spiritual ministry and the secular authority” [i.e. government] are the most important, followed by “agriculture, cattle-raising, and the necessary occupations” involved in these pursuits. So: be a pastor or government official if you could—but if not, you might want to try farming. 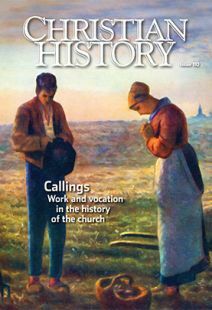 Thinking about vocation this way did more than make Christians think about the duties appropriate to callings ranging from preaching to teaching to herding cows. It also impressed all of life and society with divine significance. No work, even sweeping floors, was too menial to be of service to others and therefore to be of service to God (see “Making drudgery divine?,” p. 31). The things of this world have a significance and validity because of their status as aspects of God’s good creation. The Christian is called to live in the midst of the world and not to flee from it. And yet Calvin, Bucer, and Flavel all realized that spiritual realities must take priority. Material blessings should be used for eternal good. But that does not mean there is no reason for material blessings—as many learned from the writings of Puritan pastor, preacher, prolific author, and occasional prisoner of the English crown, Richard Baxter (1615–1691). In over 160 books, he touched on all aspects of pastoral care, moral theology, and practical Christian living. Baxter argued that the Christian realized his or her calling in the world through four main structures: personal ethics, household management (the older meaning of the word economics), ecclesiastical ministry, and civil government. Baxter was largely self-taught and extremely well read. His long ministry at Kidderminster provided him ample opportunity to instruct his flock in true doctrine and advise them in Christian living. Much of his guidance involved questions of how to serve God best amid the vagaries of life—in one’s job and outside of it. Baxter’s advice was rigorous and thorough. In his A Christian Directory, a four-volume collection of moral instruction, Baxter discussed 27 directions for “faithfully serving Christ, and doing good.” He instructed Christians to “study to do good, and make it the trade or business of your lives”—including in trade or business. Reflecting on Gal. 6:10 (“Therefore, as we have opportunity, let us do good to all people”), Baxter emphasized the responsibility to care for physical needs in service of spiritual realities. In this way Christians would gain practical insight into how the world works. “He that will do much good in the world, must be furnished with considerable abilities, especially prudence and skill in knowing when, and to whom, and how to do it. . . . Without this, he will do more harm than good.” Thus Christians must seek to become knowledgeable in human arts and sciences. All these writers, as they reflected on Christian calling, sought to properly balance the things of heaven and earth. They accepted all morally permissible forms of work and service as valid, even as they recognized the complexities of an increasingly diverse social order. Jordan J. Ballor is a research fellow at the Acton Institute and executive editor of the Journal of Markets and Morality. Christians! Go on in doing good to all men with cheerfulness. "Christians! Go on in doing good to all men with cheerfulness"
"The Lord’s calling is in everything the beginning and foundation of well-doing"